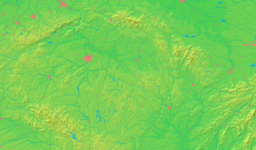 Chrudim is a district town in the Pardubice region of the Czech Republic. Chrudim lies in the center of Eastern Bohemia is located 11 km south from Pardubice and 110 km east from Prague. Nearby, 3 km distant, is Slatiňany known for its horse breeding. Archeological research shows the first people lived in the area in the later stone age (500-3500 BC). Slavs came in the 7th century AD. The first written record about Chrudim comes from 1055 AD and makes it officially one of the oldest settlements in eastern Bohemia. In the 13th century Chrudim was established and fortified as a town by the king Přemysl Otakar II. Church of the Assumption of Virgin Mary is the dominant building on the main Josef Ressel Square. Its building was started maybe in the 13th century. Old Town Hall was built in the 15th century. It is one of the oldest buildings in the city and is on the northern side of the main square. Mydlář House in Břetislavova street was built in the 16th century. It now contains the Puppet Museum. Prague Column of Christ’s Transfiguration from 1732 is in the center of the main Jossef Ressel Square. Viktorin Kornel ze Všehrd (cca 1460 - 1520), humanist, writer, lawyer, Dean of Charles University at Prague. Jan Mydlář (1572 - 1664), famous executioner. Jan Nepomuk Štěpánek (1783 – 1844), actor, theatre director of ancestor nowadays National Theatre in Prague. Josef Ressel (1793 - 1857), inventor of the ship propeller. A school and Josef Ressel Square in Chrudim are named after him. His statue is in front of the District Museum. Petr Průcha (1982 - ), hockey player for New York Rangers, SKA Saint Petersburg. Dušan Salfický (1972 - ), hockey goaltender. Athens of East Bohemia is a festival of classical music in late April. Puppet festival in Chrudim is a festival of puppet acting at the beginning of summer. Salavators pilgrimage are attractions held in august. FK Era-Pack Chrudim is a famous seven times champion in futsal. HC Chrudim, former 1st league hockey club. MFK Chrudim, former 2nd league football club. This page was last changed on 24 September 2018, at 19:12.